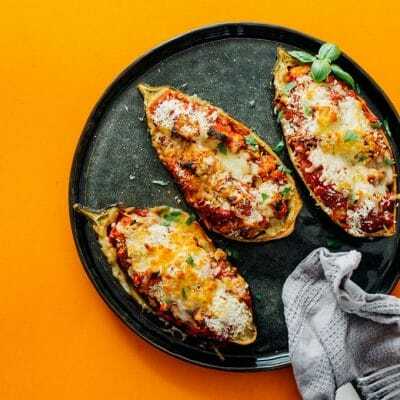 This Stuffed Eggplant Parmesan recipe takes all that’s great about eggplant parm and stuffs it in the eggplant skin, meaning less mess and easy serving! Sauce: Preheat oven to 400 degrees F. Set a medium saucepan over medium heat. Add the diced tomatoes, tomato paste, garlic, herbs, and salt. Stir to combine and bring to a gentle simmer. Eggplants: Meanwhile, cut each eggplant in half, lengthwise. Using a paring knife, score slits into the eggplant vertically and horizontally, being careful not to cut through the skin. Also make shallow cuts just inside the skin around the whole eggplant to help loosen it. Use a spoon (a grapefruit spoon if you have it) to gently scoop out the flesh. Assemble: Throw eggplant cubes in with the tomatoes, as well as half of the mozzarella cheese. Stir to combine. Spoon eggplant tomato mixture into the hollowed out eggplants. Set on a baking sheet and bake for 25 minutes, or until eggplant is tender. After 20 minutes, sprinkle remaining mozzarella, parmesan, and panko on top and continue cooking 5 more minutes until cheese begins to brown. Recipe from Live Eat Learn at https://www.liveeatlearn.com/stuffed-eggplant-parmesan/.